PIERRE, S.D. – Gov. Dennis Daugaard presented awards Oct. 20 to businesses and workers who have contributed the most in 2014 to the employment of South Dakotans with disabilities. Mike Audus of Watertown was introduced to Project Skills by a vocational rehabilitation counselor while in high school in Summit, where he was raised by his grandparents. His work experience at Dakota Tube led to a job there, moving to a new community, purchasing a vehicle and home, and, after his grandfather’s passing, caring for his grandmother until her death last year. Audus’ determination in reaching his personal goals as well as promotion of independent living and employment opportunities for people with disabilities earned him the 2014 Outstanding Citizen with a Disability award. Steve Stewart of Fort Pierre has attained his own employment goals since a 1980 accident left him paralyzed, making a career of motivating and inspiring others to reach their life goals. A rehabilitation engineer for the Department of Human Services, Stewart is known as the “go-to person” for information relating to accessibility, accommodations, assistive technology and the Americans with Disabilities Act. For his nearly 30 years in state government, Steve is known as an innovator, mentor and role model, program manager, technology solutions creator, and, now, the Outstanding Employee with a Disability for 2014. Minervas Restaurant in Watertown hires and retains people with disabilities as a natural part of its workforce, fostering partnerships within the community to promote a diverse workforce and offer equal employment opportunities for all. Minervas head chef Justin Dunn fully embraces the assistance provided by job developers, job coaches and vocational specialists to support employees with disabilities in developing work skills and reaching their fullest potential. Dunn and Matt Sawyer, general manager of Minervas and the Watertown Event Center, accepted this year’s Outstanding Private Small Employer award. 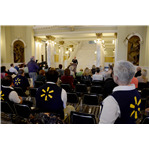 Walmart’s mission reads, “Giving people access to a better life – One community at a time.” In keeping with that ideal, the Pierre Walmart Store works with local agencies to actively recruit qualified applicants, and more than 10 percent of its current workforce is comprised of people with disabilities. Walmart provides needed supports for its employees and readily makes reasonable accommodations when requested. It is a leader in the community, partnering with others to promote the vision of a diverse workforce and inclusion for all. Walmart was named the 2014 Outstanding Private Large Employer, with local store manager Brandi Hoerner accepting the award. Kelly Stone of Vermillion has worked to expand special education services to allow students to move through school with peers of the same age since beginning her teaching career in 1999. She is described as a tireless advocate for students with disabilities in the transition process and is an integral team member who develops and implements transition plans with students with disabilities. Her focus is on providing students with life-skills opportunities – skills students will need as they transition into adulthood. Stone’s work has produced positive experiences for many students with disabilities, earning her the Outstanding Award in Transition Services. Aberdeen’s Fallout Creative Community received the 2014 Distinguished Service Award for extraordinary contributions to advancing the empowerment and employment of people with disabilities. It started informally in 2001 at the Red Rooster Coffee House, a hub of activity for the Fallout, and grew into a tight community of people who had many creative expressions and, frequently, barriers in their lives. An initial grant from the S.D. Council on Developmental Disabilities enabled the Fallout to have creative events on a regular basis, and it formed as a non-profit organization in 2008. The Fallout Creative Community continues to function through smaller grants and contributions to support projects such as inclusive/accessible art and music parties, theme parties, dances, film projects, live talk shows, karaoke, open mic night and art exhibitions. Dan Cleberg, Red Rooster co-owner, accepted the award. 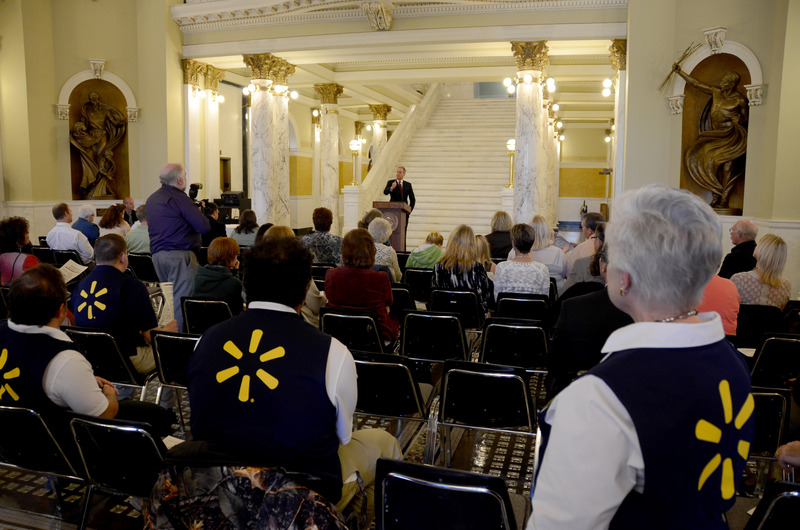 The 2014 Governor’s Awards ceremony was co-sponsored by South Dakota’s Board of Vocational Rehabilitation, Board of Service to the Blind and Visually Impaired, the Statewide Independent Living Council and the Department of Human Services.